Alone or in teams, be the quickest to find and memorize songs, movies, proverbs... and, with the three successive answers, form a new incongruous sentence. 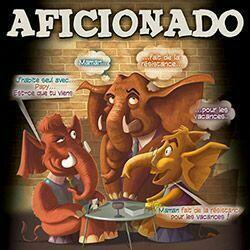 The game consists of 45 "Aficionado" cards, with on each of them 6 puzzles (3 per side). The game can be played individually or in teams. The active player randomly takes one of the 45 "Aficionado" cards and chooses one of the "enigmas", "enigmas" composed of 3 sentence beginnings, sentences that can be titles of movies, songs, poems, etc... He reads them aloud and in an intelligible way, setting the tone or not of as he pleases. The answer is "Sir died dancing the Javanese." ! The solution is therefore composed from the title of Adamo's song "Vous permettez, Monsieur? ", the famous sentence from Act II Scene 1 of Molières' play "L'école des femmes" and the verse from Serge Gainsbourg's song "La Javanaise". The first player to win 7 cards is declared "Great Winner".